Somalia and Ethiopia will jointly invest in four seaports to attract foreign investment to the two countries, an official statement said. The move comes after an official meeting between Ethiopia’s Prime Minister Abiy Ahmed and Somalia’s president Mohamed Abdullahi Farmaajo in Mogadishu. 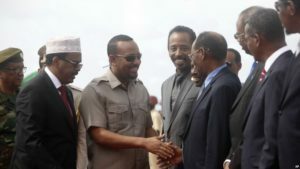 The two leaders held talks on business, security, peace efforts and integration during Abiy’s four-hour stay in the city. According to the joint statement, the two leaders pledged to cooperate on everything from the development of infrastructure, including roads linking the two countries, to expanding visa services to promote cultural exchanges. Ethiopian Prime Minister Abiy Ahmed said his country will abolish trade barriers with neighbor Somalia as part of an effort to create a single market in the Horn of Africa region. The leaders laid “singular focus” on economic growth and bilateral investment to “secure a prosperous future” for their people, the countries of the Horn of Africa and ultimately the African continent, the statement said. In June 2007, Ethiopian soldiers have helped the Somali government to topple the Islamic Courts Union that briefly ruled the capital. Posted by Khalid Al Mouahidi on June 18, 2018. Filed under Business. You can follow any responses to this entry through the RSS 2.0. Both comments and pings are currently closed.